The number of various appetite suppressant products sold on the market is overwhelming. Some work well, others don't. How can you know which suppressant is the most effective? Reading through reviews will provide you some broad ideas, however, it may be useless simply because each person's body is different and a hunger suppressant that is the most effective for a certain person may not be effective for you. It is probably the best idea to give a try to a few hunger suppressant supplements and see which is for you the best. Make sure that when you're purchasing an appetite suppressant, it includes 30-day open bottle money back policy. Read the small print to make sure the seller will also refund shipping fee. Our company provides 60-day FULL money back policy on our Skinny Piggies appetite control supplement so that you can give it a try and see for yourself how effective this product is. 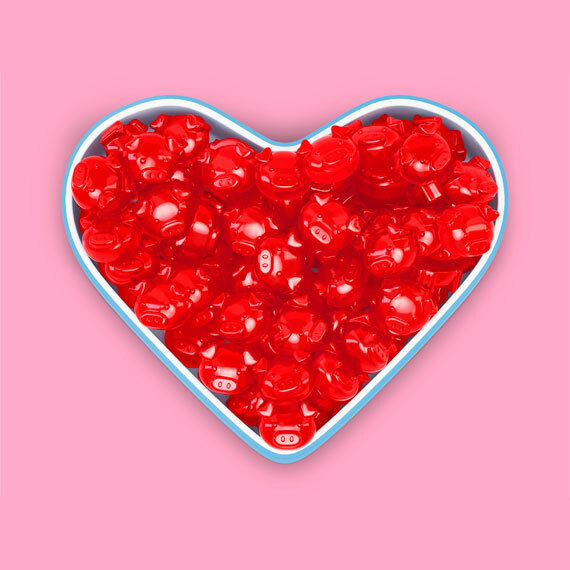 Why is Effective Appetite Suppressant Gummies The Most Trending Thing in Dieting? Do you like eating tasty food but also would like to drop weight? Losing body fat is about achieving a caloric deficit which will almost certainly make you hungry constantly. Fortunately, now you can support your fat-loss with a unique, natural appetite suppressing, Skinny Piggies! 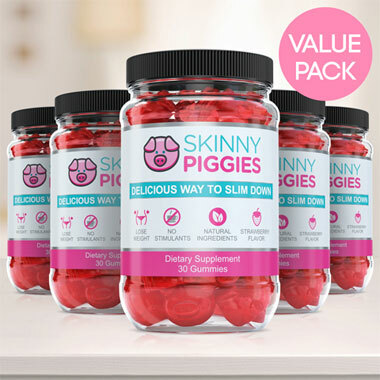 Skinny Piggies are remarkable strawberry flavored gummies that lessen being hungry and cravings for food while enabling your body to stay in fat loss mode. To lose fat, it is critical that you consume less calories than you daily. When the body is low on food-based fuel, it starts using the body fat for energy, which results in getting rid of unwanted weight for you. If you want to achieve such caloric deficiency, you will want to either increase your burned calories through extra physical activity or eat less calories. To get the ideal results, you may really want to do both. Skinny Piggies help you eat less and minimize your caloric intake and that makes achieving fat burning easier. Include an additional regular physical activity in order to help accelerate the fat loss process. If only weight loss were this easy! Though cutting back on your calories sounds easy in theory, in practice your powerful cravings are likely to make you dreaming about sugar snack the whole day. You don't need to give into sugar binges. 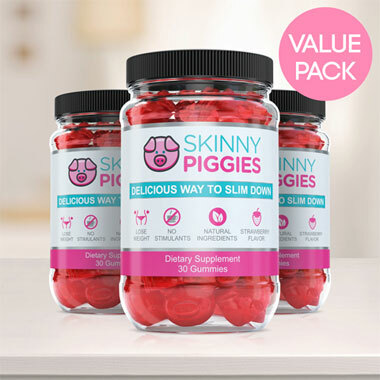 Skinny Piggies are tasty effective appetite suppressant gummies that naturally help suppress your appetite, meaning that your cravings will be soothed without you cheating on your diet. The idea is very straightforward. Hunger is caused by two key things: the number of calories you consume and the presence of food in the stomach. After a big meal, your stomach stretches by the food pressing against the sides, which results in you feeling satisfied and you stop eating. When you start taking Skinny Piggies before eating lunch or dinner, you will feel fuller, faster. Having a Skinny Piggy with a glass of water just a half hour ahead of eating dinner will cause it to expand in your stomach and makes you feel you just ate a large meal. This way you can stop appetite and eat less, all without seeming like you're eating less than before. The gel also allows your stomach to empty much slower leaving you satisfied longer. The sooner you are satisfied, the less likely you are to continue eating and that lets you to achieve a reduced caloric intake. As the viscous gel surrounds the food you ate, it slows down the absorption of carbohydrates and that normalizes your blood glucose level. By minimizing spikes in the blood sugar you stop those pesky sugar cravings. Eliminating blood glucose spikes in your daily life by slowing down digestion, helps prevent your meals from getting stored as body fat. By keeping your body in weight loss mode, our effective appetite suppressant gummies help your body slim down. How do Skinny Piggies Measure up against other Fat-Loss Gummies? Thereis no end to the number of types of weight loss pills being sold on the market. From diet dietary supplements to hunger suppressants, it's not easy to find out what diet supplement is right for you. Going through the research on each product is a fruitless task, but Skinny Piggies are unique for the following reasons. 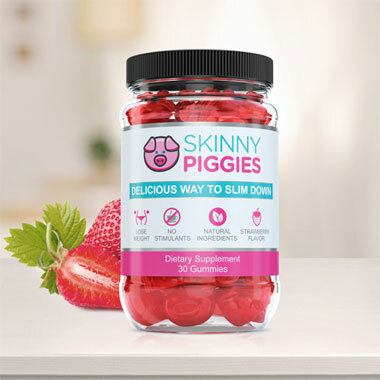 Delicious Flavor: Few dietary products actually taste great, and almost none have the great tasting flavor of strawberry gummies, that's why Skinny Piggies are a treat you'll look forward to. Healthy Nutrients: Not only Skinny Piggies help you curb appetite, they will also support the stronger hair and nails and keep your skin glowing. Genuine Ingredients: Unlike other fat-loss products, it's possible to pronounce every ingredient in our diet gummy supplements, knowing that you're eating the best nutrition. No Harsh Chemicals and Stimulants: Using a dietary product without stimulants means that there aren't limits on when you may take it. You'll really like eating these so forgetting to take your supplements will no longer be a hurdle. They're easy to use and anyone can get going right now. Try one and they will certainly become a highlight of your day.